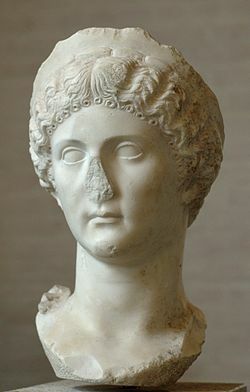 Julia Drusilla (September 16th, 16 AD – June 10th, 38 AD) was the second daughter and fifth child to survive infancy of Germanicus and Agrippina the Elder. She was therefore the sister of the Emperor Caligula. Drusilla also had two sisters Julia Livilla and the Empress Agrippina the Younger who became the mother of the Emperor Nero. Drusilla was born in Abitarvium, modern day Koblenz, Germany. She returned to Rome after the death of her father. In 33 AD, Drusilla was married to Lucius Cassius Longinus, a friend of the Emperor Tiberius. However, after Caligula became emperor in 37 AD, Caligula had her divorce and remarried her to his friend, Marcus Aemilius Lepidus. During Caligula’s illness in 37AD, he changed his will to name Drusilla his heir, making her the first woman to be named heir in an imperial will. Drusilla was Caligula’s favorite and was rumored to be his lover. Whether or not there was an incestuous relationship is not actually known. Drusilla shared a close bond with Caligula which is why some regarded her as his prostitute. Following Caligula’s recovery in 38AD, Drusilla died perhaps of plague, at the age of about twenty-two and Caligula then had her deified. Caligula stayed at her side and upon her death, he at first would not allow anyone to remove her body. She was buried with the full honors of an Augusta, as if she was Caligula’s wife. He had the Roman Senate declare her a Goddess as “Diva Drusilla”. The next year, Caligula named his only known daughter Julia Drusilla after his late favorite sister who was born in 39AD by his wife Milonia Caesonia. The one-year-old Julia Drusilla was assassinated along with her parents on January 24th, 41AD. Julia Drusilla, with her two sisters, were immortalized on a bronze sesterius issued by her brother, Caligula.